Marissa Moss shares the brutal experience of her husband’s deterioration from ALS, in her unflinching graphic memoir, Last Things. Moss, a successful author of many children’s books, including the Amelia’s Notebook and Young American Voices series, finds a subject closer to home in Last Things—her husband Harvey’s diagnosis and eventual death of Amyotrophic Lateral Sclerosis (ALS), also known as Lou Gehrig’s disease. After symptoms emerge during an overseas trip, Harvey Stahl, a distinguished professor of medieval art at the University of California, Berkeley, quickly declines, slurring words and having trouble walking. Moss relates the story through her eyes, but also through Harvey’s and their children’s when possible, giving a complete view of the tragedy from all sides. Moss’s black-and-white illustrations are simple but expressive, perfect for telling this story. 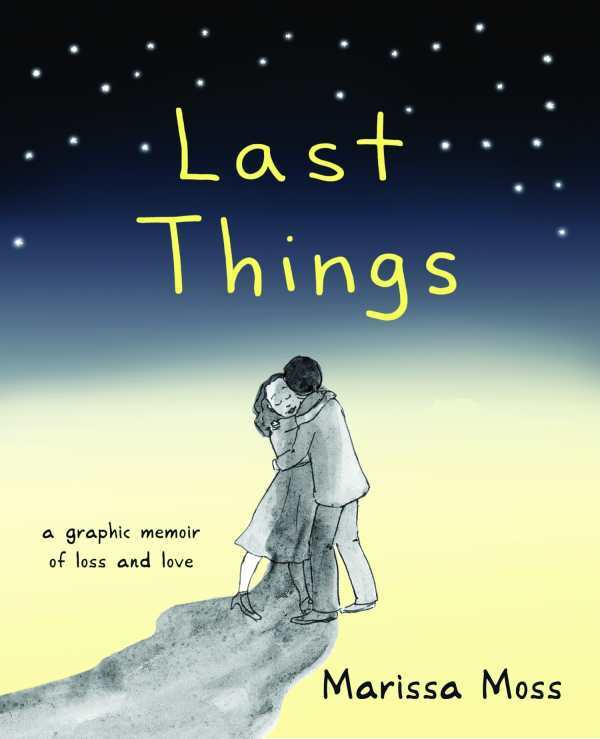 Last Things is difficult to read at times, grueling in its emotional detail, but ultimately it stands as a moving memoir and a guide not just for those caring for someone afflicted with ALS, but anyone seeking a better understanding of the processes of dying or grieving.